Most people think the New Age Movement has gone into obscurity, but it is more popular than ever before. It is no longer seen as fringe beliefs but is mainstream. The fact is the church has its doors open to the new age movement, many of it teachers unknowingly and some knowingly have adopted and promote its practices. How? By accepting new age concepts and practices without knowing what they really are. In this DVD set we cover the basics. Starting with Mike's testimony of coming to Christ from being involved in the new age movement. 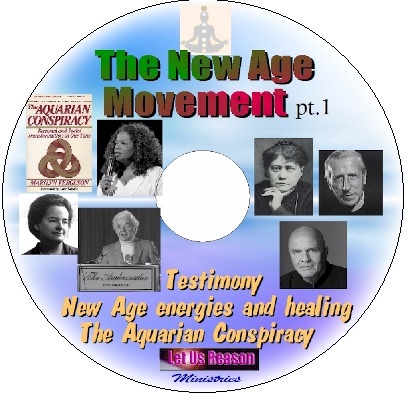 The Aquarian Conspiracy written by Marilyn Furgueson that began with Helena Blavatsky, Alice Baily and Pierre Tielhard de Chardin, which is what we are now seeing come to fruition through its promoters like Oprah, Tolle, Dyer, Walsch and so many others. What are the New age energies being used to heal? yoga, karma, the Jesus of the gurus. False spiritual masters of the hierarchy, spirit guides, channeling and UFO's are all covered and exposed. A copious amount of videos with Power point accompany their quotes and explanations. This video also covers the most susceptible and vulnerable of all, the children who are being influenced greatly into new age practices by the books they read. Parents need to be more aware than ever what they are purchasing from online bookstores and what is happening at their schools. Probably the most dangerous part of this movement is the use of "I am" decreeing and chanting Gods holy name as yourself. We are in the midst of a worldwide Occult revival, learn how to recognize what is taking place and protect yourself and loved ones from this movements influence. Copyright (c) 2018 The material on our website can be copied and used in its original format Portions lifted from articles can be reproduced for ones personal use for witnessing, for teaching and apologetics. Any other use, such as posting is to have the permission of Let Us Reason ministries. If you have trouble printing an article please copy the web page by highlighting the text first - then click copy - then paste the article into a word program on your computer. We would like to hear from you. Please send us an e-mail and let us know how we can be of more help. Our time is just as valuable as yours. Please keep in mind, that we only have time to answer sincere inquiries. We will use discretion in answering any letters.